In Italy the expected short tenure of the Monti government is a concern, but despite the protests in Athens, the pattern of election results in other peripheral countries suggests that voters will not turn to the populist far-left parties outside the government. Fear of chaos—and especially the fear of being blamed for causing the chaos—will likely keep any new unity government committed to the IMF program, with broad support in parliament. Threats to pull the plug at any moment by individual parties are not credible in the face of determined European political and financial pressure. A broader concern, of course, is the prospect for growth under the IMF program. Prime Minister Mario Monti's emerging technocratic government, moreover, has been launched with wide support already in parliament, maximizing the prospects for structural reform. Here again, threats to withdraw support by Silvio Berlusconi should be dismissed as political posturing. He and his party will not want to be blamed for undermining the possible rescue of Italy. Monti's government, once formed, will be hard for the former embattled prime minister to abandon. It is now clear that the ECB under the new presidency of Mario Draghi, the former governor of the Bank of Italy, has been vindicated in its strategy of refusing to defend Italian bond spreads around the 400–450 basis points, thereby forcing Italy to implement the reforms the central bank sought in August. In the end, it was the Italian political class that blinked first in this latest game of chicken and pushed Berlusconi out. If there were any doubts about the ECB's use of markets to force actions, they were dispelled by Bundesbank President Jens Weidman, who told the Financial Times: "There's also a risk that you mute the incentives that come from the market. Recent experience has shown that market interest rates do play a role in pushing governments towards reforms. You have seen that in the case of Italy quite clearly.3"
Such is the extraordinary power of the ECB, a supranational and wholly independent central bank, that it can orchestrate the fall of elected leaders through its power to intervene and support highly indebted euro area sovereigns. No wonder Nicolas Sarkozy has been so intent on getting a Frenchman back on the ECB Executive Board. But this is only the latest round of the crisis, and there are more to come. It would be a mistake to believe that the ECB will now be more willing to go in and reward countries for good behavior. The notion that Frankfurt would effectively guarantee long-term funding levels for good performance at, for example, 4 percent is completely unrealistic. The ECB will only provide protection against tail-end catastrophic events and not set itself up as a lender of last resort. The logic of the central bank's approach is obvious. Any such guarantee would be subject to "political moral hazard" and remove or dilute the incentives to undertake long-term structural reform programs. As Weidman put it, "[m]onetary financing will set the wrong incentives, neglect the root causes of the problem, violate the legal foundations on which we work, and destroy the credibility and trust in institutions. You won't solve the crisis by reducing incentives for the Italian government to act." This is a view undoubtedly held widely on the ECB Governing Board. Yet, it is critical to note that this principled opposition to pre-committing to bailing out national governments does not rule large emergency purchases of bonds under the Securities Market Program (SMP), even if a minority of the ECB governing council members were opposed. Viewed from the crucial perspective of political incentives, the lack of a pre-commitment to ECB intervention is totally different from its more receptive approach to SMP purchases. Ironically, the ECB's quest for independence makes it more likely to continue its autonomous SMP purchases alone, rather than facilitate such purchases by governments by providing leverage to the European Financial Stability Facility (EFSF), as earlier discussed in Europe. The bank's interest is to avoid any appearance of being in league with, or influenced by, euro area governments. Judging from recent Swiss experience, there is little doubt that a pre-commitment to a fixed central bank intervention target might ultimately result in fewer central bank financial resources spent on intervention. However, it is a profound mistake to believe that the ECB cares particularly about the scope of SMP purchases, when compared to the imperative need to present euro area politicians with the right incentives to continue reforms. They might generally (for reasons of sterilization and stability) want to restrain such purchases, but it is not really about the money they spend. It's all about the incentives, stupid! Instead, the ECB is forced to intervene in euro area national bond markets and purchase the functional equivalent of US state and local government bonds—something the Federal Reserve has to date not done.5 It is moreover easy to imagine that Ben Bernanke, the Fed chairman, would be "treated roughly" in Washington and quite a few places, if he bought bonds issued by, for example, Illinois or Rhode Island before they committed to overhauling their state pension systems or fixing other structural defects. Simply calling for the ECB to replicate what the Bank of England and the Fed have done is politically naïve and ignorant of the fundamental differences among these central banks. Still another argument against funding guarantees is that such a step would lead to a whole range of countries clamoring for such a benefit, hoping to get out from under the demands for stability and structural reforms. Lastly, it would be misguided for the ECB to resist scaling up its bond purchases out of concern over the redistributive effects of such interventions.6 The concern that the ECB will be saddled with large credit losses from its SMP interventions is questionable, and the ECB Governing Board probably does not take it seriously. Greek bonds purchased by the ECB are not included in the credit write-downs of privately held debt, otherwise known as the Private Sector Involvement (PSI) of banks. Because the ECB can extract credit enhancements for Greek bank collateral from the euro area, it will almost certainly be a more senior creditor than euro area governments (but still below the IMF). Accordingly, the prospect of ECB balance sheet losses on sovereign Greek bonds looks premised on a fallacious assumption of a complete euro area breakdown that increased ECB purchases can prevent. If there is a "redistributive concern" over the SMP program, it will derive from the political problems of distributing the potentially sizable financial gains when all the bonds bought by the ECB at distressed prices are redeemed at par by austerity-stricken peripheral governments. Still another reason for the ECB not to "go big" and commit to unrestrained lending relates to the full scope of its wish list, which includes not only domestic structural reforms but changes to EU and euro area institutions. Former ECB president Jean-Claude Trichet called repeatedly for a "quantum leap" in euro area institutional integration, for example. Judging from recent statements by the ECB leadership, what euro area political leaders have so far agreed to do is not satisfactory to these leaders. Again, to quote Weidman: "In my view, the declaration from leaders at the last EU summit was not clear enough. They talked about minor treaty changes. But this is not a minor change—this is a major change with follow-up changes in national constitutions. Without clear answers, you might not have the basis for a stability-orientated monetary union." The "Six-pack"… falls short of the "quantum leap" that the ECB had long advocated for the euro area. A major drawback is that the new governance package still leaves the [EU] Council with too much room to apply discretion when deciding on the execution and enforcement of the surveillance procedure. Another vital shortcoming relates to the large amount of exceptions and relevant factors that need to be taken into account when it comes to applying the excessive deficit procedure. This creates loopholes and could endanger the transparency and therefore the accountability of the fiscal governance framework as a whole. The definition of "limited Treaty changes" is uncertain, but recent calls by Chancellor Angela Merkel of Germany for a "breakthrough to a new Europe" suggests the political ground is being prepared for a more comprehensive reform of the EU Treaty and more comprehensive integration in the euro area. The semi-official trial balloon by the five German Economic wise men, calling for a temporary pooling of euro area sovereign debt in a European "Redemption Pact," is similarly indicative of the shifting German political landscape. The Redemption Pact proposal, which is politically shrewd and tailored to address German constitutional concerns, could offer the short-term economic benefits of a conditional pooling of parts of euro area sovereign debts. Because of its realism and feasibility, this proposal is among the most interesting proposals to emerge to date. Hopefully, EU leaders will give it serious consideration. Of course, a new institutional framework for the euro area will come only after lengthy consultations and in some cases referenda, with the outcome inherently unpredictable. With the ECB staying on the side lines, volatility and uncertainty will be a fact of life for a long time. What happens, however, if the ECB's forceful tactics of using financial market pressure to bludgeon Italy produces a Pyrrhic victory—a general undermining of market confidence in the euro area and the impairment of the risk free status of all non-German sovereign debt? Whether or not France retains its AAA-rating (which it probably will), the recent widening of French spreads suggests that French bonds have begun to trade more like "credits" than as risk free assets. But what happens if market confidence does not return and the current (and rising) market funding pressure on euro area sovereigns and banks persists despite an improved outlook for reform? In his first press conference as ECB president, on November 3, Draghi fretted about the market "overshooting" and driving up sovereign spreads in the euro area, even as he said that the bank's interventions should not been seen as "external help" if they are undertaken to alleviate temporary market pressures. Remember that financial markets are often oblivious to fundamentals and thus have "gotten it wrong" for long periods in the euro area sovereign debt markets. Their mistake has until the last few years been on the other side of the spectrum. For a decade Greece borrowed at near German interest rates, when any examination of the facts would not have justified that level of confidence in Greek finances. Markets could well remain shell shocked for years and fail to reward even the substantial improvements in the euro area structural reform agenda, especially if the ECB does not act preemptively. In that situation, a negative feedback loop could easily drive up the cost of bank and government funding, contributing to lower economic growth, which in turn would drive up rates. A similar negative feedback loop emerges if traditional investors in sovereign debt markets simply shun all peripheral bonds on grounds that they are not risk-free assets. In such a scenario, any improvements in the fundamentals of peripheral countries will be ignored by investors erroneously focused solely on how sovereign bonds behave in the short-term in secondary markets. This fate need not be a self-fulfilling prophecy for several reasons. With respect to bank funding pressures, in the presence of persistent market illiquidity, the ECB can act to improve the situation. The weekend comment by Bundesbank President Weidman offered a novel dual definition of the ECB mandate, stating: "I will just confirm to you that we will act according to our mandate and provide liquidity to solvent banks and ensure price stability—this is our task." The ECB can, for instance, offer unlimited liquidity beyond one year, expanding further its covered bond purchase program or adjusting the eligibility criteria for ECB collateral. Meanwhile euro area governments must enforce gradually higher capital requirements and that this be achieved not merely by reduced lending. In the sovereign bond markets, however, the market's unwillingness to fund peripheral euro area governments at lower interest rates, despite reform implementation and euro area institutional integration, will clearly not be alleviated by the ECB—even as it remains ready to prevent yields from rising to catastrophic levels for "good reformers." The ECB may not be required to act, moreover, once euro area based real money managers look at the current yield differentials among euro area sovereigns. 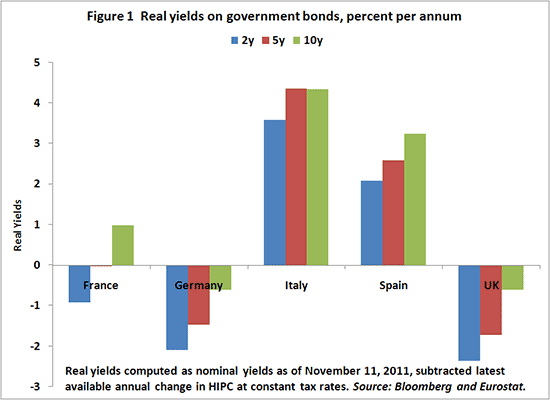 Figure 1 illustrates real yields for the four large euro area members and the United Kingdom. If I am wrong and acute risk aversion in euro area sovereign debt markets remains and fear continues to trump greed in the face of reform implementation and progress, euro area regulators and policy makers must be ready to adopt new tactics. One of them would be a kind of soft "financial repression," in which reforming European governments would effectively direct nominally private euro area investors towards greater investments in peripheral government debt. Put another way, euro area governments overseeing a currency union in rough external balance—and one in which reform and progress are achieved—should not allow their pampered and politically protected domestic financial services industry to reduce its holdings of euro area sovereign debt. Such soft "financial repression" would create more captive buyers and border on coercion directed, for example, at pension funds, insurance companies in charge of tax benefitted retail savings, or banks that benefit from government support and guarantees. Another "soft repression" alternative could take the form of extending tax benefits to various types of government debt purchases or exempting institutions that purchase sovereign debt from a financial transaction tax, if one is eventually passed in the euro area. A soft financial repression path would of course be a dangerous slippery slope. But with the euro area's economic future at stake and political progress gradually being achieved, responsible euro area leaders must not let fickle financial markets turn liquidity concerns into solvency crises. 1. Nuclear weapons have never been used in anger since August 1945, but through their massive and mutually understood destructive capacity instead provided the foundation for the deterrence that kept the Cold War cool and the basis for cooperation. They were "political weapons" acquired to grant the possessor "deterrence influence" by taking away some options for action from the other side. That's why the North Korean government has them and Iran wants them today. 2. The fact that during last week's budget vote in the Portuguese parliament, the main opposition Socialist party did not vote against the government's far reaching austerity budget is another testament to the broad political consensus in Lisbon about pursuing the IMF program goals. 4. The ECB has to my knowledge not purchased any "proxy eurobonds" issued by the European Commission, the European Investment Bank, or the EFSF. 5. There was however some speculation that the Federal Reserve in late 2010 might purchase Californian bonds, and Ben Bernanke of course explicitly stated in his famous 2002 speech to the National Economist Club that the Federal Reserve has the authority to buy state and local government debt. Due to the unitary character of the United Kingdom, neither Wales nor Scotland has legal authority to issue their own bonds, so the Bank of England to date does not have this option. This may change in the future, though, as political devolution continues in the United States. 6. See the Financial Times blog post on November 10 "Does the ECB Really Have a Silver Bullet?" for an example of this erroneous view. 8. Note from the General Secretariat to COREPER/General Affairs Council, November 8, 2011. 9. See my colleagues Joseph E. Gagnon, Nicholas R. Lardy, and Nicholas Borst for an estimate of the massive financial costs to China from continuing its massive investment in low yielding US assets.